(Nanowerk News) Just as proteins are one of the basic building blocks of biology, nanoparticles can serve as the basic building blocks for next generation materials. In keeping with this parallel between biology and nanotechnology, a proven technique for determining the three dimensional structures of individual proteins has been adapted to determine the 3D structures of individual nanoparticles in solution. A multi-institutional team of researchers led by the U.S. Department of Energy (DOE)'s Lawrence Berkeley National Laboratory (Berkeley Lab), has developed a new technique called "SINGLE" that provides the first atomic-scale images of colloidal nanoparticles. SINGLE, which stands for 3D Structure Identification of Nanoparticles by Graphene Liquid Cell Electron Microscopy, has been used to separately reconstruct the 3D structures of two individual platinum nanoparticles in solution. "Understanding structural details of colloidal nanoparticles is required to bridge our knowledge about their synthesis, growth mechanisms, and physical properties to facilitate their application to renewable energy, catalysis and a great many other fields," says Berkeley Lab director and renowned nanoscience authority Paul Alivisatos, who led this research. "Whereas most structural studies of colloidal nanoparticles are performed in a vacuum after crystal growth is complete, our SINGLE method allows us to determine their 3D structure in a solution, an important step to improving the design of nanoparticles for catalysis and energy research applications." Alivisatos, who also holds the Samsung Distinguished Chair in Nanoscience and Nanotechnology at the University of California Berkeley, and directs the Kavli Energy NanoSciences Institute at Berkeley (Kavli ENSI), is the corresponding author of a paper detailing this research in the journal Science ("3D Structure of Individual Nanocrystals in Solution by Electron Microscopy"). The lead co-authors are Jungwon Park of Harvard University, Hans Elmlund of Australia's Monash University, and and Peter Ercius of Berkeley Lab. Other co-authors are Jong Min Yuk, David Limmer, Qian Chen, Kwanpyo Kim, Sang Hoon Han, David Weitz and Alex Zettl. Colloidal nanoparticles are clusters of hundreds to thousands of atoms suspended in a solution whose collective chemical and physical properties are determined by the size and shape of the individual nanoparticles. Imaging techniques that are routinely used to analyze the 3D structure of individual crystals in a material can't be applied to suspended nanomaterials because individual particles in a solution are not static. The functionality of proteins are also determined by their size and shape, and scientists who wanted to image 3D protein structures faced a similar problem. The protein imaging problem was solved by a technique called "single-particle cryo-electron microscopy," in which tens of thousands of 2D transmission electron microscope (TEM) images of identical copies of an individual protein or protein complex frozen in random orientations are recorded then computationally combined into high-resolution 3D reconstructions. Alivisatos and his colleagues utilized this concept to create their SINGLE technique. "In materials science, we cannot assume the nanoparticles in a solution are all identical so we needed to develop a hybrid approach for reconstructing the 3D structures of individual nanoparticles," says co-lead author of the Science paper Peter Ercius, a staff scientist with the National Center for Electron Microscopy (NCEM) at the Molecular Foundry, a DOE Office of Science User Facility. "SINGLE represents a combination of three technological advancements from TEM imaging in biological and materials science," Ercius says. "These three advancements are the development of a graphene liquid cell that allows TEM imaging of nanoparticles rotating freely in solution, direct electron detectors that can produce movies with millisecond frame-to-frame time resolution of the rotating nanocrystals, and a theory for ab initio single particle 3D reconstruction." The graphene liquid cell (GLC) that helped make this study possible was also developed at Berkeley Lab under the leadership of Alivisatos. TEM imaging uses a beam of electrons rather than light for illumination and magnification but can only be used in a high vacuum because molecules in the air disrupt the electron beam. Since liquids evaporate in high vacuum, samples in solutions must be hermetically sealed in special solid containers - called cells - with a very thin viewing window before being imaged with TEM. In the past, liquid cells featured silicon-based viewing windows whose thickness limited resolution and perturbed the natural state of the sample materials. The GLC developed at Berkeley lab features a viewing window made from a graphene sheet that is only a single atom thick. "The GLC provides us with an ultra-thin covering of our nanoparticles while maintaining liquid conditions in the TEM vacuum," Ercius says. "Since the graphene surface of the GLC is inert, it does not adsorb or otherwise perturb the natural state of our nanoparticles." Working at NCEM's TEAM I, the world's most powerful electron microscope, Ercius, Alivisatos and their colleagues were able to image in situ the translational and rotational motions of individual nanoparticles of platinum that were less than two nanometers in diameter. 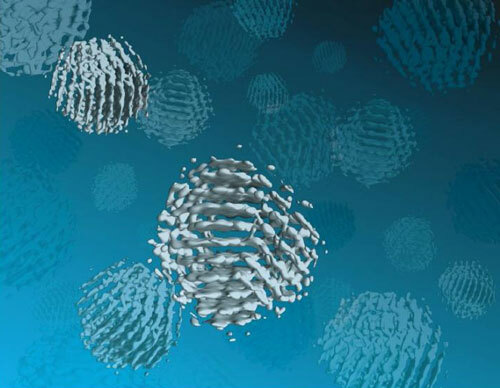 Platinum nanoparticles were chosen because of their high electron scattering strength and because their detailed atomic structure is important for catalysis. "Our earlier GLC studies of platinum nanocrystals showed that they grow by aggregation, resulting in complex structures that are not possible to determine by any previously developed method," Ercius says. "Since SINGLE derives its 3D structures from images of individual nanoparticles rotating freely in solution, it enables the analysis of heterogeneous populations of potentially unordered nanoparticles that are synthesized in solution, thereby providing a means to understand the structure and stability of defects at the nanoscale." The next step for SINGLE is to recover a full 3D atomic resolution density map of colloidal nanoparticles using a more advanced camera installed on TEAM I that can provide 400 frames-per-second and better image quality. "We plan to image defects in nanoparticles made from different materials, core shell particles, and also alloys made of two different atomic species," Ercius says.